Autumn with you today to share a traditional wedding card design. I decided to do white and silver, as opposed to gold, with this card and kept the palette monochromatic. I layered the lovely new Wedding Cake die over our Nesting Stitched Oval, using a mini oval for my embossed sentiment. This cake die is exquisite and will be used for many occasions, besides weddings. I layered again over a Basic Grey embossing folder adding a silver mat. I created a three-loop organza bow with my bow maker and wrapped the tails around the card. I really love the added fluff! 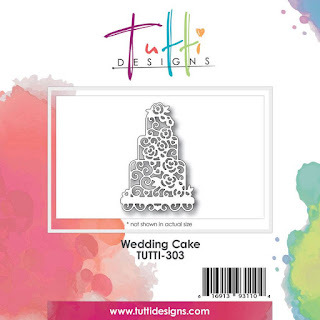 Purchase your Wedding Cake die HERE today! This is just GORGEOUS Autumn!!! Love the richness of the silver metallic paper used for the cake and the texture of the embossing adds even more richness to this beautiful creation! Then the softness of that beautiful bow is the 'icing on the cake' (so to speak, lol)! Wonderful inspiration ... thanks so much!